My day started when I opend my eyes (quite late) and was greeted by this sight through my bedroom window – the first strike of the sun upon the snow covered peak of mount Maroma. I am treated to this view without even lifting my head from my pillow. It is priceless. It was a good omen for a very special day. The start to my 2015 camino! I am planning to walk the camino Mozarabe this year, from Málaga. And as I only live around 60 km from Málaga I have opted to start from my front door. I am not planning to walk this camino in a single outing, rather relish each stage over the next few months. 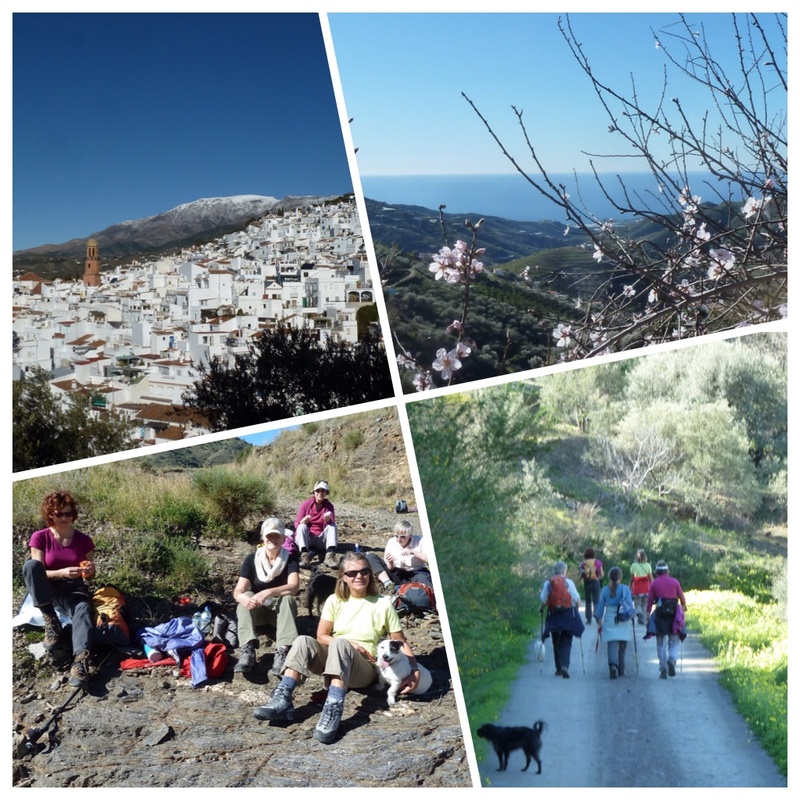 So today I set off from home in the village of Canillas de Albaida to meet up with friends along the way until our band of five met with Renate, my Dutch friend who would lead us on a walk to the coast via the ‘La Corca’ area. Renate is going to walk 200 km with me along the first leg of the Mozarabe from Málaga to Córdoba. She has time restrictions and can only walk in mid March, which is a little early for me. So I am keeping an open mind as to what I do when I reach Córdoba. 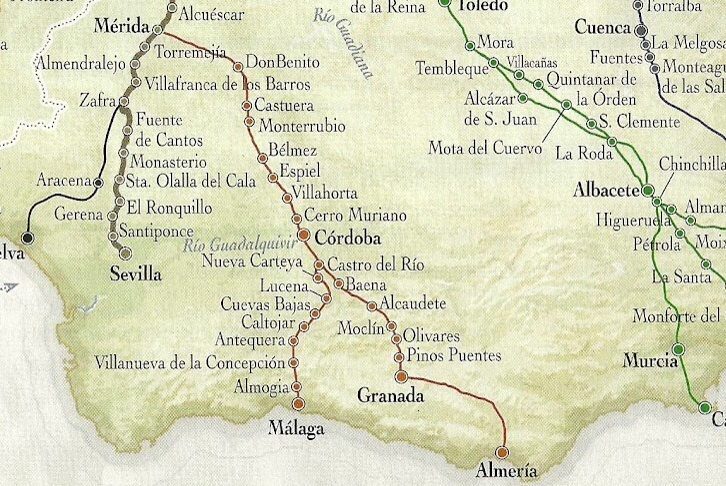 If the weather promises to be fair for a couple of weeks I shall probably continue as far as Mérida where the Mozarabe intersects with the Via de la Plata (the camino route from Seville), and then return home to complete the route later in the year. Whereas if the weather is not favourable I shall return home with Renate from Córdoba and continue later in the year from this point. 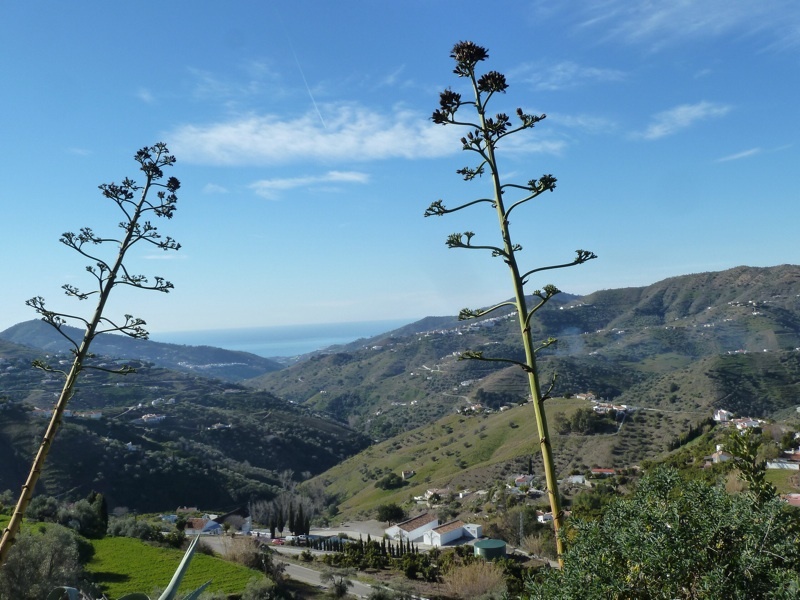 The camino Mozarabe also has starting points in Almeria and Granada which meet with the Málaga route just before reaching Córdoba and then continue in a north westerly direction to Merida. So this was day one of the adventure for Renate and me, and we had the company of some great walking friends on this first leg. The day started with a rather blustery wind but once we started our descent into the valley we were protected by the hillsides and soon started stripping off layers of clothing. Roly had the company of Jack Russell Toby and both were, as usual, impeccably behaved. We made a good pace and hit the coast after I had been walking for four hours and we had another hour’s walk along the coast road to Algarrobo Costa where we were met by David and a friend of my walking pal to be driven back up the mountain (although not before a couple of refreshing beers overlooking the Mediterranean. Total distance for me was 26.3 km, a little longer for some and a little less for Renate. But we all felt suitably knackered at the end. Next stage will be from Algarrobo to Rincon de la Victoria, and then from Rincon into Málaga. The day had been very warm, probably reaching mid to high twenties centigrade – not bad for late January! We all thoroughly enjoyed the walk which was new to all of us except Renate. 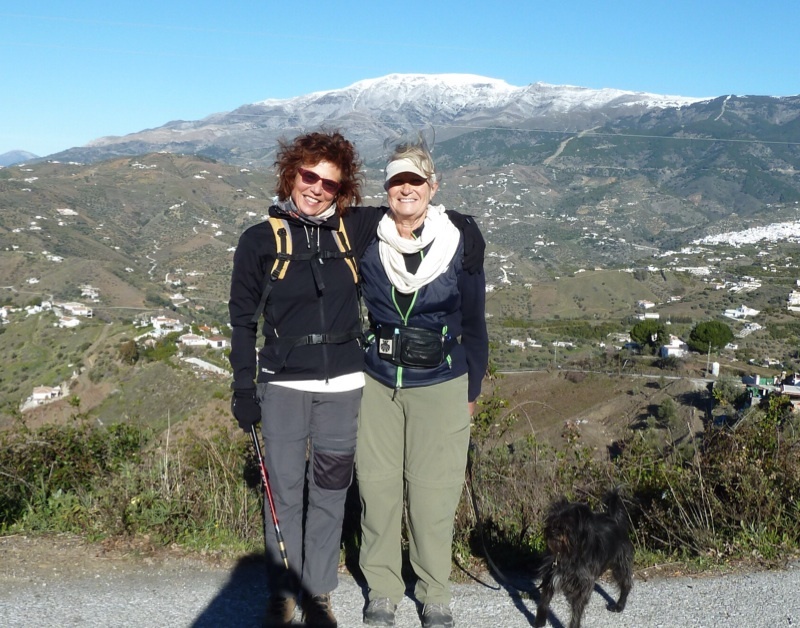 Renate and I really felt we had started our camino, although we still have six weeks or so until set set off from Málaga. It was an excellent day. 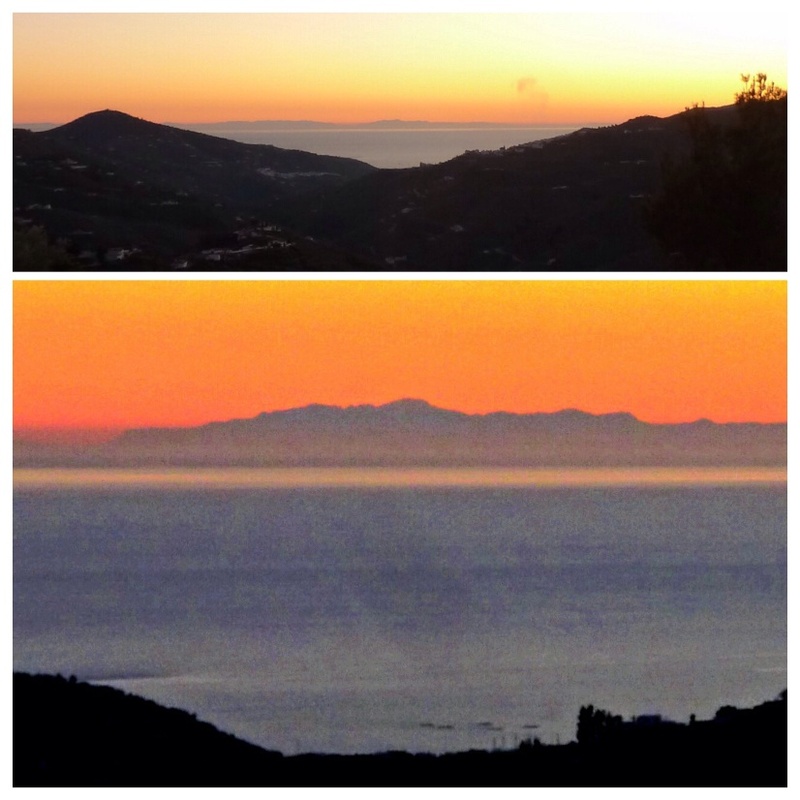 And to finish it off in a spectacular way, we had the most amazing view of the Rif mountains in North Africa, which are in the region of 180 km distant and can be seen on a clear day, and are an amazing sight at sunset. I think this was the clearest view I have ever seen. A perfect ending to a fabulous day. Edit: due to her busy life, it turned out that Renate was not able to join me on my walk from Malaga. In reality this was a good thing, because I didn’t really want to start walking in March, and in the meantime I found a wonderful walking partner via a pilgrim forum and we set off on 8 April. This entry was posted in A view of life, Camino de Santiago de Compostela, Camino Mozarabe, Expats in andalucia and tagged Camino blog, Camino de Santiago blog, Camino de Santiago., camino Mozarabe, Canillas de Albaida, Rif mountains. Bookmark the permalink. Thank you, I will enjoy reading your updates. The route that you are walking is something I might want to take another year. Not this year. I will be in Portugal and Spain for July/August/September for various shorter camino routes with 2 stints of serving as hospitalera. 2nd half of July in Zamora…. so IF you continue onto the VDLP, stop by and say hello. Hi Ingrid and many thanks for visiting the blog. Which routes will you be walking? I will definitely (hopefully!) be walking the VdlP from Merida although probably not in July – a bit too hot for me. Maggie, there will be some shorter routes. A bit of the Portuguese before Zamora, then a bit of the Norte walking into Miraz for another hospitalera stint, last 2 weeks in August and then September to walk my beloved Galicia. This year I and Rita only must we do the English Camino (from Ferrol) and continued to Finisterre. Lovely to hear from you Aurelio. Please pass my best wishes to Rita. We must keep in touch – it may be that we are in Santiago at the same time – that would be fabulous. Buen Camino! I’m excited to read about your Camino (and anxious to start mine back up in March-April, depending on weather)…amazing photos. Great to hear from you. Which camino will you be doing and will you be blogging each day? I will look forward to reading all about it. Camino del Norte, and I’m not sure if I’ll blog every day or not. As I’ll be doing días sueltos for a bit, those yes. When I take off for longer routes…I’ll probably type up my journal at a later date. I can’t wait to read about yours! I think you are inspirational. Only wish I was as fit. Tony, I’m afraid I don’t deserve your praise. I’m not really feeling very fit at the moment and have a few kilos I hope to lose before starting my camino proper (or I shall have to buy some new hiking pants!). This was an easy walk – practically all downhill from 660 m to sea level. Walking out of Málaga will be a very different story! Hi Ineke, lovely to hear from you. We won’t be walking our next stage for a couple of weeks, but I am walking with Renate again in a couple of days. 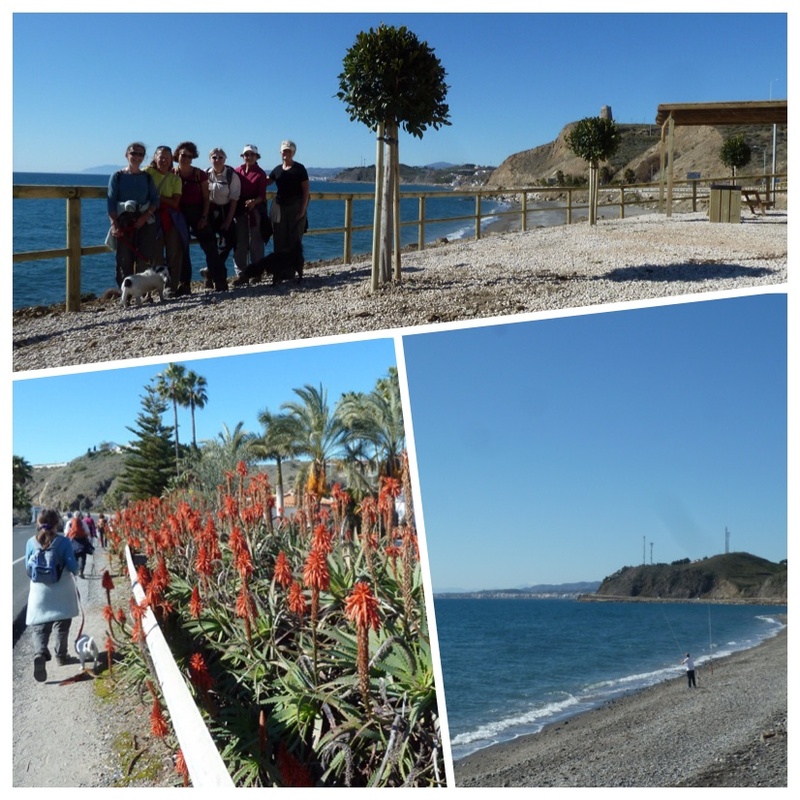 And afterwards we will be planning our walk from Málaga. Thanks for your visit – I hope to be posting to my blog every day from the camino so you will be able to follow Renate’s progress. Maggie, how wonderful – another Camino (and from your doorstep no less)! This time I get to follow you in real time and not after the fact. I am totally looking forward to your postings and pictures. Happy and safe travels to you and your friends! Many thanks Sandy for your continued support. It was great to start walking this camino from home, albeit not all in one go – it saves a lot of money on airfares too! With all best wishes on your new Camino! So looking forward to your entries, hope to be on the Way later this year. Thanks Bonnie, which camino will you be walking? I’m looking forward to joining you virtually on this walk. Great start! Thanks Clare. Have you firmed up your plans yet? I have a persistent desire to do the Via de la Plata in Spring. However, I have accepted that it won’t happen this year. I don’t want to be “squeezing” in a long pilgrimage between other equally/more important activities. However, October-November 2015 is still reserved for the Camino. The Frances is the default, of course, but what do you think the VDLP would be like at that time? Hopefully I will have walked the VdlP from Merida by autumn so I should be able to make a judgement. The weather can be more settled in autumn than in spring. Much cooler in the morning and evenings, but can still be lovely and warm durngi the day. Another grand adventure! Yeah! Have fun and will look forward to your wonderful blog posts! Many thanks Kristina. What a lovely blogging/caminoing community this is. Clare, who commented below was also walking the CF last year. Maggie I am hugely impressed already and didn’t know about a walk to the coast via La Corca. What lovely pictures – can’t wait for the next instalment! It was a lovely walk Janice, and of course it was all down hill. Wouldn’t have wanted to walk back though! It was a lovely walk in great company. Where were you in Andalucia? I was in Nerja for eight months. I’m sitting here on my porch overlooking my garden; its a cool spring morning here in California. The flowers and blossoms are popping out all over . I picked up my phone to do some quick reading before getting some work done. I just wanted to thank you for sharing your wonderful stories . They carried me away to Spain and God willing my feet will be there some day to. It must be wonderful to have a long peaceful road in front of you and all the time you need to savor every bit of the experience. Hi Derek – thanks so much for your comment. I haven’t travelled a great deal, but I can’t think of a better form of transport than one’s own feet. Your description of your morning reminds me of the thirty minutes I have just spent in my garden, last of the day’s March sun streaming down, blackbirds singing their hearts out and surrounded by the scents of jasmine, hyacinth and freesias (and the glass of cava certainly didn’t detract from the moment!). You must come to Spain and try it for yourself.